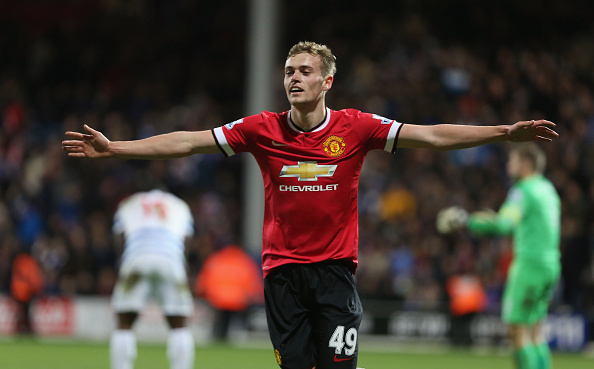 Louis van Gaal has a tough decision to make: Radamel Falcao or James Wilson? Manchester United manager Louis van Gaal seems to in a dilemma regarding his selection of strikers with Colombian international Radamel Falcao yet to live up to his high wages and fierce reputation and young Biddulph born striker James Wilson seemingly making the most of his chances. After failing to even make the bench in United’s home defeat against Southampton last weekend, the rumours of the loanee from Monaco being unable to secure a permanent move in the summer were on the rise. Thus, when Robin van Persie injured himself, Falcao was handed a start against Queens Park Rangers. But it wouldn’t be completely wrong to say that the Colombian failed to make the most of his chances. He came close to scoring thrice but was unable to convert his opportunities. His first effort lacked the required subtlety, as he struck the curling ball from Juan Mata straight at Robert Green and even his rebound effort was tipped away by the English goalkeeper. But his closest opportunity came when he was gifted with a chance to tap in by fellow striker James Wilson, which he missed to everyone’s amazement. Television replays later showed that the Colombian was denied his goal mouth chance by a crucial last-ditch touch by the sliding Steven Caulker. The Falcao situation at United is much of a conundrum for the United manager and his staff with El Tigre still unable to display the same attacking prowess he was once revered for after returning from injury. Falcao, who was brought on loan, with mammoth £265k wages has started 13 games for United, playing 753 minutes and scoring 3 goals along with a few assists along the way. But that is nothing compared to the Falcao everyone feared would rip Premier League defences apart. A player, who can be described as an ideal No.9 who feeds off others around him, he still hasn’t been able to link up with Wayne Rooney and co which has been a factor behind his lack of goals. He has been through a few knocks while at United and has taken quite some time to recover from them; and in the end, these could play an important role behind the decision to land a permanent deal at Old Trafford. With Falcao seemingly lacklustre in front of goal, it was 19-year-old Wilson who rose to the occasion, it was academy graduate James Wilson who managed to catch eyeballs. Since replacing the injured Johnny Evans in the second half, Wilson proved to be a big menace for the Rangers’ defence with his pace, making darting runs and creating goal scoring chances. He created two brilliant opportunities for Falcao, but it was he who put the ball into the back of the net in the end. Though his first shot was saved, he didn’t make any mistake in converting from the rebound, sealing victory for the Red Devils. The goal was Wilson’s first this season, hopefully the first of many the fans would hope. The 19-year-old striker came to the attention of the scouts at United at the tender age of seven and since then has worked his way up the ranks at United’s academy, maintaining a good goal scoring record. With his goal poaching instincts and bursting pace, he was a key figure behind United reaching the U21 Premier League Cup Final last season. And with his debut brace against Hull at the end of last season, Wilson managed to earn praise from the then interim manager and now assistant Ryan Giggs. It was Giggs’ recommendations which made Van Gaal turn towards Wilson and the youngster has really made the most of his opportunities. With an approximate wage bill of about £1000, Wilson surely is one for the future at United given his age and talent, and the Old Trafford faithful have a lot of expectations from this lad from Biddulph. Van Gaal has stressed on the fact that wages don’t matter to him and that opportunities would be given to players on the basis of how they perform and not their star status. With Wilson playing well, the pressure is on Falcao who has to improve in order to make his move to Old Trafford permanent next season. A wounded tiger trying to claw his way back or a young gun thriving on his chances, Louis Van Gaal has got a tough decision in his hands – both for the rest of the season and the upcoming summer.